Check out my first Facebook Live video (and please excuse the accompanied nervousness lol). 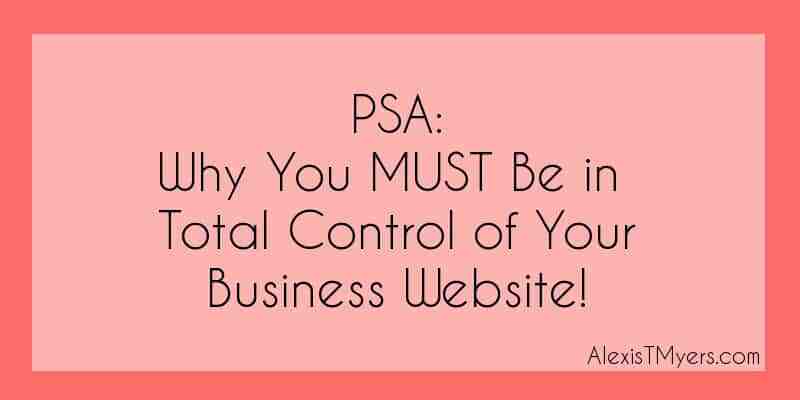 It’s really important for me to share this message, because there are a lot of misconceptions about what’s necessary, what all is involved, and how much you actually have to spend just to get started with your business website. I’m really passionate about making the tech affordable and doable so you can get started DIYing your business website easily, instead of being held back by unnecessarily large upfront costs. The resources needed to get started designing your site beautifully and professionally (even without any prior tech or design skills). A bonus resource to help you get started with a highly recommended online business practice. If you want to learn exactly how to use all the resources mentioned in this video, so you can get your website setup in a day. 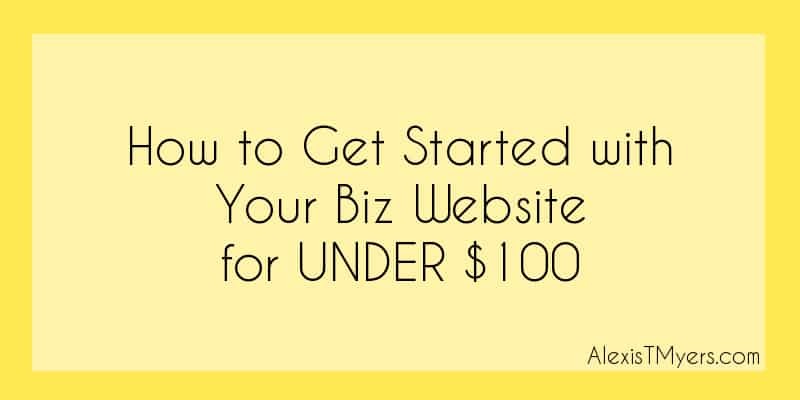 Make sure you sign up for my upcoming online workshop, Creating Websites 101 for Entrepreneurs. I’ll be sharing my screen and teaching you step-by-step everything you need to get your website setup and start designing it beautifully. And if you’re on any platform other than WordPress.org (the self-hosted version) and you’re ready to upgrade your website to the best platform for your business where you fully own and have total control of your website, this workshop is for you too. 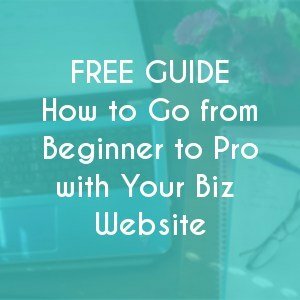 Don’t miss out on this free training where I’ll be teaching very important information every entrepreneur should know when creating their business website. I look forward to seeing you at the workshop! And a recording will be available if you’re not able to make it live. What did you learn from the video that you didn’t already know? What other videos would you like to see on my blog? What other questions do you have about getting started with your business website? What is the difference between widgets and plugins? I’m confused about plugins and widgets, what do they do? Do I need to add widgets or plugins to my site to add this specific functionality? So today, we are going to answer these questions and more. Click below to watch the video tutorial. What did you learn from the video tutorial? What other video tutorials would you like to see on my blog? What other questions do you have about plugins and widgets? Today, we’re talking fonts. 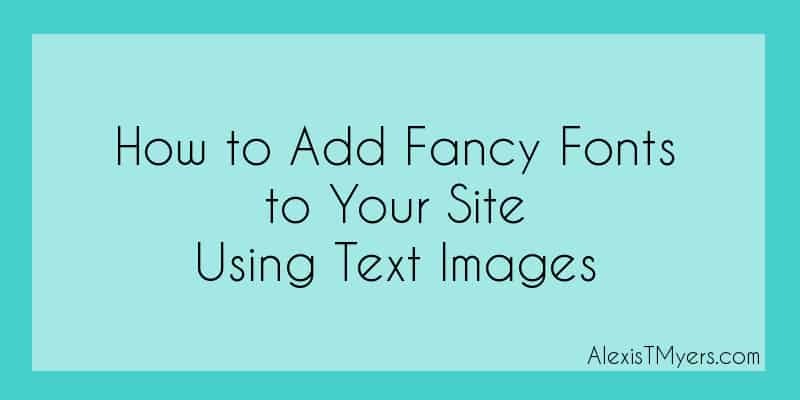 It’s so easy to add your unique personality to liven up your site, simply by adding fonts and colors. And I’ve found, while working with my clients, that many of them find it hard to easily incorporate their favorite fonts while customizing their sites. So in this post, we are going to simplify things and make it easy to add your own fancy brand fonts to your website to enhance your design. Click below to watch this free training. Divi – the best premium WordPress theme to create a beautiful and professional website EASILY with a drag & drop page builder and TONS of customization options, with NO coding required! What are your favorite ways to add your personality and authenticity to your website? It’s understandable why so many people struggle with technology. It’s not always the easiest thing to figure out or deal with at times, and it gets a bad rap because of this. Believe it or not, technology really doesn’t have to be extremely difficult and it’s actually possible to make it easy. A lot of people subscribe to the mindset of “I’m not techie” or “technology is too difficult”, so they create mental blocks that stop them from ever even trying. Or they start out trying to do things on their own and find out that things are a bit more involved than they thought, so they become frustrated and overwhelmed, again creating a block, which stops them in their tracks. Here’s the thing… Web design and creation really only consists of learning basic skills, concepts and techniques. When you can have things broken down so that you become familiar with the simple things that make up the big things, everything becomes much easier. These things can take some time to learn, and there will always be new things to learn. But isn’t that the case for everything worthwhile? Technology is learnable and, most importantly, doable. Whether it comes easier for some than others is irrelevant in the grand scheme of things. Even for those who learn slower and have a harder time figuring things out, it’s all still possible and CAN be made easier. It can be quite intricate. BUT, there will always be resources and shortcuts available to make the process easier. Because this is what we as humans do. We constantly make all aspects of life easier, so that we can all enjoy it as much as possible. Technology is no different. You just have to be made aware of the easier route to take. It creates new possibilities and opportunities everyday. It solves problems and adds convenience. It moves the world forward. So with the full truth of technology in mind, I want to break down the major ways to make website creation and design as easy as possible for beginners and DIYers. In case you are DIYing your website out of necessity or convenience, let’s make sure you have an overall better experience with it. Every experience you have is shaped by your mindset. Multiple people can have the exact same experience and come away with a different opinion and interpretation of it. This is because we all have our own individual perspective and mindset. Although your mindset can be shaped by past experiences, you still have the control to change it, starting with your consciousness and awareness. Step #1: Take inventory of your thoughts and feelings towards technology. What you think and what you say dictate your experience. And when you start to pay attention to what you say and how you feel, that’s the first step to making the change. Step #2: Reframe your thought process. The longer you sit around wanting someone else to do it for you or fretting over how hard you think technology is, the more frustrated you’ll be when you’re the one who has to do it. If you have this mindset every time you attempt to do anything with technology, you’re approaching it with frustration and resentment before anything bad even happens, which inevitably makes it more difficult. Every “techie” person started as a newbie. No one came out of the womb knowing how to build online empires from scratch. At some point, even the best of us knew absolutely nothing and had to fumble around to find our way. So the fact that you may be fumbling around, learning slower, or not getting it in the beginning doesn’t mean that this is not for you and it’s only reserved for others. It’s possible for you to learn how to do what you need to do, whether technology comes easy for you or not. Now there’s a difference in acknowledging your strengths and weaknesses, and having an overall negative perspective of technology. It’s totally fine to acknowledge that technology is not one of your strengths. It’s a fact that some people excel at technology, while others don’t. This does not negate the fact that technology is still possible and CAN be made easy for everyone, tech savvy or not. It’s all about perspective and the attitude you approach it with. The fact that you are choosing to DIY means you are faced with technology whether you’re savvy or not. Perspective is everything! When you open your mind and embrace the fact that it’s possible for you, the pathway will become clearer and the entire process will become easier. The more you take heed to these steps: (1) take inventory of your thoughts, (2) change the language in your head, and (3) embrace the fact that it really is possible for you (which ultimately gives you a brand new perspective on the entire experience), the more you’ll start to truly open up to technology and create experiences that could truly surprise you. I promise. Try it before you knock it. I’ve already talked about the importance of owning your site and using WordPress. And now that we’ve worked on your mindset, let’s discuss practical ways to make the whole web design process easier for you. When using WordPress, you’ll find there are thousands of free themes. Although I promote doing things free when possible, themes are an exception. Free themes tend to lack flexibility when it comes to customization. They also don’t offer support to help you navigate, tweak and troubleshoot your theme when needed. When you’re putting your business online, it’s important that you represent it authentically and have the flexibility to be able to customize your website to your heart’s content. It’s also important to have support when manipulating your theme, because as with all technology, it’s fickle, and if you have to fend for things alone, it can make things a lot more difficult. For these reasons I always recommend using premium (paid) themes for your business website. It’s the most professional and beneficial way to go. Contrary to popular belief, it’s not necessary to learn tons of code and difficult techniques (or pay thousands for someone else to do it for you) in order to customize your site with a premium theme that represents your business and brand authentically online. And who wants to spend the time or money for all of that anyway? What you really want to do is get your message out there, service your clients and customers, and start making money and making a difference. So it’s time to skip the difficult learning curve and get your website up so you can be in business. A perfect resource for this is the super customizable, dynamic and easy-to-use theme from Elegant Themes, named Divi. As a former web designer who learned code and all kinds of extensive techniques to create cool features and effects on sites, after finding Divi it has revolutionized web design, in my opinion. It makes seemingly advanced and admittedly impressive features and techniques super easy with a drag and drop page builder. I highly recommend it. Not only have I used it repeatedly on several different sites and projects, NEWBIES and admitted “NON-TECHIES” have used it and find it easy to use and navigate. They are excited to show off the websites they are able to create with it! To cut down on the overwhelm of all the different options out there and answer the ever-popular question “Which theme should I choose?”, and to ensure you don’t end up with a cookie-cutter site, Divi is the way to go. With it, you can authentically express the true essence of your brand and business. And to top it off, they are constantly improving. They just released some major updates and upgrades a couple of weeks ago, that make their existing features even better, while adding even more features and design options. And they are planning to make even more upgrades in the near future. 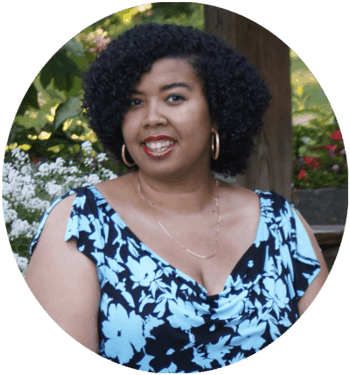 My final tip to make website creation and design easier is to use the incredibly affordable WordPress support system WPCurve (not an affiliate link). This is the perfect solution for DIYers who may feel overwhelmed by some of the more involved techie aspects of websites, but aren’t ready to hire ongoing help in the form of a VA or Web Designer. When it comes to ongoing website maintenance, backups, security, core updates for WordPress, themes and plugins, or even configuring an intricate plugin, WPCurve can take these things off your hands. Here is a list of tasks they can do for you to make your DIY experience a great one and give you peace of mind that the necessities are being taken care of. You can choose from their Standard or Professional options, ranging from $79 – $99 per month, which is is A LOT cheaper than you’ll pay any VA or Web Designer for ongoing maintenance of your website. This is why they are perfect for DIYers. They don’t build or design your site for you, but they definitely take all of the most difficult and scary aspects out of your hands. If you don’t feel like you can afford the paid support of WPCurve just yet, be sure to refer back to tip #1. Remember, you can do this. 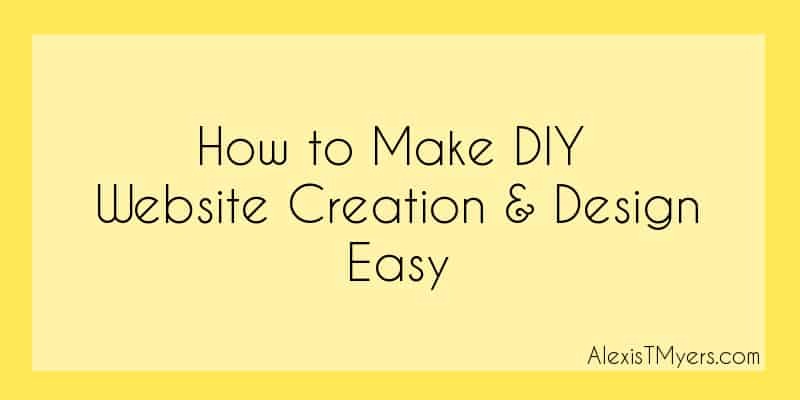 How have you found ways to make your DIY website creation and design process easier? What resources have you found that have helped eliminate frustration and overwhelm? I’ve been working with websites for several years now, and in that time I’ve come across so many different options, opinions and scenarios on how to do this website thing. In this post I’m going to share my experience and expertise on this topic so you can make the best decision for your business website. First things first, this is your business website, not just any website. Whether you’re “techie” or not, it’s important for you to know what full ownership of your website means and why it’s the best option for your business. As a “newbie” or a “non-techie” to websites, it can be easy for you to get caught up in the flashing lights of certain website platforms’ witty advertising, or the allure of how “easy” they make website creation. But it’s important for you to do your own research and learn the basics of website creation so you’ll know what you’re getting into. So let’s break it down. (1) Buy your own domain name from a domain hosting company aka domain registrar (my recommendation is NameCheap.com). When you do this, you are registering the domain name so that no one else can claim it. You actually have rights over it and can resell it at any time for any price (if it’s a really desirable domain name, you can even sell it for hundreds or thousands of dollars, which is WAY more than you actually paid for it). (2) Purchase your own hosting account from a website hosting company (my recommendation is Hostgator.com). This gives you access to and control of ALL the files that make up your entire site, no matter what software you choose to build it. At this point you are in the driver’s seat and in total control of all the decisions made about YOUR website. Whether you want to or have to deal with the full extent of your website’s files or not (which is more back-end tech than necessary for most), you have the access and ownership to do what you please with your website. This is important because let’s say you pick a hosting provider in the beginning, but as your business evolves and your needs change, your hosting provider may no longer fill those needs. Or maybe your hosting provider’s services change over the years, and you no longer feel they are a good fit. Since you have total ownership of your website’s files, you can move your complete site, without ever losing any of the design or content to an entirely new hosting company. No matter what software you choose to create your site, or extensions you add to it, you can pick it all up in one package and move it (this will actually be done with your website’s backup file, which is one of the reasons why it’s so important to do regular backups of your site. The backup is simply a .zip file that contains every single file necessary to bring your website to life). And don’t worry, you don’t have to move your entire website if you don’t want to. Your hosting company can take care of what they call a migration for you, but only if and when you tell them to. You can do the same thing with your domain name. Since you are its owner, you can transfer it to a different domain registrar to get better service, lower prices, etc. Again, when you take these 2 major steps YOU are in control and get to choose the best service for you, your business and your website. When we’re putting our businesses, livelihood, talents, gifts, passions and purpose on the line, shouldn’t we be the ones in total control of the platform we use to share ourselves with the world? Should You Choose to Build Your Site? After you’ve purchased your own domain name and hosting account, the next step is to determine what to use to actually build your site. There are several options you could choose from. Dreamweaver – If you want to code your own website from scratch, you could use a software like Dreamweaver. This is the old school way to do things for coding geeks who really wants the creative freedom of coding their entire website from scratch. And even today, more and more web designers and developers who code sites for a living use WordPress to build sites instead of Dreamweaver. There’s been a natural evolution over the years of people (newbies and experts) making life easier for themselves and choosing WordPress (whether they want to code or not). Default Hosting Website Templates – If you want to keep things basic, you could choose one of the default website templates that come with your hosting account. Although, this is not recommended if you want a truly professional and attractive site. Those default hosting website templates are really just place holders for you to get something up rather than having nothing. But your business is more than just a placeholder, I’m sure. Read more to find out how to make your site match the awesomeness of your business. Content Management System Software – The most popular and beneficial option is to build your site using a content management system like WordPress, Joomla, or Drupal. These content management systems are so popular and beneficial because they are open source, which means they are run by a community of users. In other words, the people who actually use the software are able to create extensions (like themes and plugins) that add functionality and features needed based on their own experience and usage. This, again, puts the user in the driver’s seat and more in control. You are not held to that particular software’s control by only being able to use what they produce. The users themselves are free to not only create the functions and features needed, but they can also profit from it. There are MANY companies and businesses that have been started to create premium themes and plugins for WordPress alone (I’m sure the same is with Joomla and Drupal). This creates opportunity for everyone. The “non-techie” people get to benefit from added features and functions that were created with their specific needs in mind from the user perspective. And the creators of those features and functions get the benefit of creative control (and financial gain in some instances), along with the opportunity to contribute to a community of creators. It’s a win-win for all! The simple answer is because you don’t get ANY of the benefits listed above when you do. But let’s break it down so you really know what’s up. When speaking of sites like Blogger.com and WordPress.com (which is different from the self-hosted content management system software mentioned above, WordPress.org), these are free blogging platforms, created to give you a simple start to creating a blog. If all you want to do is blog, you could choose one of these options. But I still recommend building your own site, because you never know how successful your blog could become. And when it’s time to grow, you’ll inevitably run into limitations with the free platforms and eventually need the benefits of having full control of your own website. Also, you should know that since these platforms are free, you are held to their terms and conditions, which state that they could shut your site down at anytime for various reasons. This means you could lose all of your content because you don’t actually own the platform, you’re lending your content to it. So keep this risk in mind when considering these options, especially for your business. When referring to services like Wix, Weebly, or Squarespace to build your site, this can get a little tricky because they have fancy advertising and use a lot of the words “newbies” and “non-techies” want to hear. These sites used to be free options as well, but lately it seems their free options are diminishing (or so limited that you have to upgrade quickly to even do a decent amount of business), and instead they are promoting a “website in a box” approach, where you get “everything for one low price”. There have been SO many debates and discussions in online business forums over Wix, Weebly, and Squarespace vs. WordPress. But there’s really no comparison. When you go with any of those other services you DO NOT own your site, they do. Lately in their advertising, instead of saying “get a free website”, they are saying “get free hosting” (I’m convinced they’ve only changed that language because they know people are wising up and realize they need to have their own hosting in order to have ownership of their site. So they’re appealing to the need for hosting and calling it free so they seem more desirable). Newsflash people: There’s no such thing as free hosting!! SOMEONE is paying for it, and whoever is paying for it is the person who owns it. And if they’re giving it to you for “free”, then you’re not directly paying for it. They charge you a fee and say it includes “free hosting”. What they’re really doing is allowing you to create websites on THEIR hosting, where THEY are the ones in control of your website files and how you create and design your site. They give you “free hosting”, then charge you extra for each domain email address you create with them. This is ridiculous, because if you paid for your own hosting, you’d get as many domain email addresses as you want for FREE. This should come with your hosting package, and if it doesn’t you’re with the wrong host or need a better package! They create tons of website templates to make it “easy” for you to design your site (they can do this, because they are the ones with full control, so they give you what they want you to use to make it “easy” instead of allowing you to choose from the wealth of resources out there). They allow you to use only website templates and extensions they create and have affiliations with. So if you decide you like your site design after you build it on their platform, but you no longer like their service, you will NOT be able to move your entire website’s files (like I mentioned before) to a new host. Their website templates, extensions, etc. only work with their system. Again, leaving them in control. They allow you to buy domain names from them, and in some cases you still don’t fully own your domain name even after you’ve bought it from them. Owning your domain name means you purchase it from a certain domain registrar and you have the freedom to host your website anywhere you want, not just with them. So if you decided to host your site elsewhere (for better service, price, security, etc.) you could then connect that hosting account to your domain name. For instance, let’s say you buy your domain name from one of these “all-in-one” places. Then you find out the importance of having your own hosting account and decide you want to connect a different hosting provider to your domain name you already bought from them. You WILL NOT have access to your name servers, which is the area where you can put in specific information to tell your domain registrar where to host your website. This is because they are built so that you ONLY use them. You would have to transfer your domain away from them, to your own domain registrar, so that you could then have full ownership and access to everything you need. On top of all of this… You’ll inevitably run into limitations when it comes to customizing your design or having the flexibility to evolve and expand your business when you go with any of these services. This means when you’re ready to do more with your business through your website, or you’re feeling the need to do fancy customization techniques to more fully express your brand authenticity, you’ll run into road blocks. Aren’t we all in this for the long haul? Don’t you plan on being in business for quite some time and growing exponentially? Why go with a “free” or “more convenient” version in the beginning, just to run into limitations and obstacles when it’s time to go to the next level in your business with functionality or design? Owning your own website has incredible benefits that consistently serve you through the evolution of your business. So with all of that information on what NOT to choose… Now we get to the million dollar question. Before we get into my opinion, let’s check some stats, shall we? This diagram comes from W3Techs.com – Web Technology Surveys. And the actual page that details the comparison of all of these sites is here. I encourage you to browse their site. 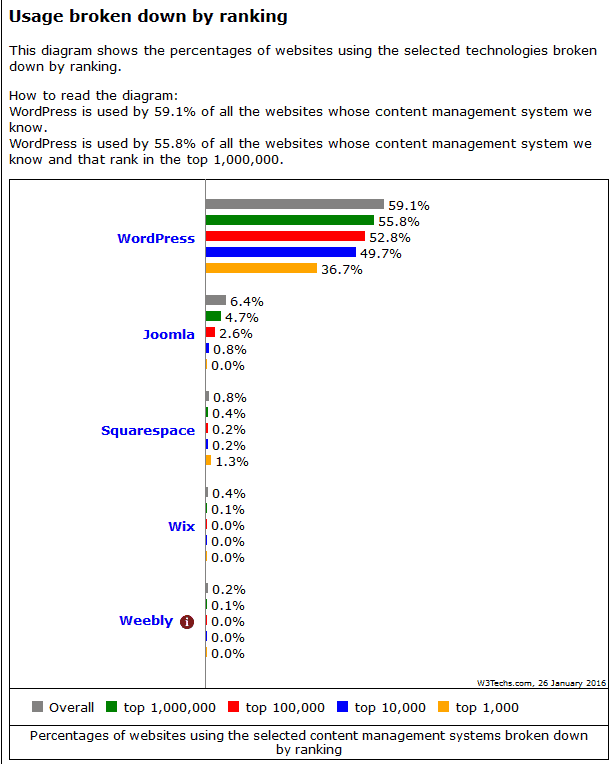 You’ll notice on their homepage even more stats that show WordPress on top. And displaying this diagram is not some vain popularity contest. People will only repeatedly use what works well, gives them the best experience, and offers the best options. As the saying goes, numbers don’t lie. Here is my opinion after working with WordPress since late 2009, and also working with Joomla, WordPress.com, Blogger.com, having brief dealings with Wix, and doing my research on all others mentioned. We’ve already talked at length about the importance of owning your site. Now, let’s discuss the other important benefits. With WordPress, you have the ultimate flexibility to design your website with whatever features, functions and customization your business needs. 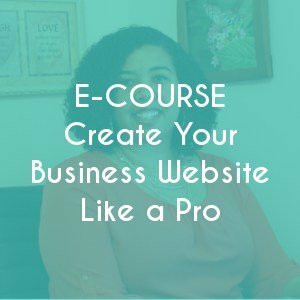 Whether you’re a massage therapist, jewelry maker, artist, coach, consultant, trainer, dog walker, restaurant owner, or speaker, etc., you’ll have the power to create the business website of your dreams. It’s also a lot more user-friendly and versatile than others, which lends itself to DIYers and web designers/developers alike. On top of design flexibility, your site can grow and evolve with you. If you start out small and end up creating an empire with multiple products, services, programs, courses, locations, etc… You can create as many WordPress websites as you need for the same monthly fee inside of your hosting account. And there are so many plugins and themes that are constantly being created, updated and upgraded to accommodate the growing needs of many different business models and offerings. Speaking of creating an empire, that’s exactly what many entrepreneurs have done with WordPress. Below is a small list of just some of the highly successful and multi-million dollar entrepreneurs who have effectively created empires with online and offline businesses, using WordPress for their business websites. Some of them have even gotten into the WordPress business and started creating themes and plugins to help other entrepreneurs be successful with WordPress in their businesses. Curious if these people really use WordPress or not and don’t want to take my word for it? It’s ok, I encourage you to do your own research. 🙂 Use this site BuiltWith.com to enter the link to each website, then scroll down until you see the section called “Content Management Systems” to reveal that WordPress is indeed what is powering their websites. Many of them not only use WordPress for their business websites, but to also house their online training content that serves thousands. This is called following in the steps of successful people who have done what you want to do. Period. Aside from all that’s listed here, there are other benefits that haven’t even been mentioned, like the fact that Google loves WordPress sites. This means they are built for great SEO results and get picked up by search engines at a higher rate than others. It can be tricky to feel like you still have control of your site when you have to hand it over to someone else to design it for you. So here are some important tips to make sure you always remain in control. Always, always, always, keep your domain and web hosting log-in information in a safe place that you can easily access. Don’t just sign up for these services and never write down your username and password. When it’s time for someone else to have access to your log-in information, use a free password service like LastPass.com. This will allow you to give someone else access to the site of your choosing without them ever seeing your log-in information. Both parties have to have LastPass for this to work, but that shouldn’t be a problem since it’s free. In the event that someone else (like a tech savvy friend or designer) offers to handle the purchase of your domain or web hosting for you, in an effort to make things easier, you should decline. You always need to be the one who purchases your own domain name and hosting account. Everything needs to be in your name with your credit card information and no one else’s. You do not have to be techie to make those purchases. Once you have your own accounts, then give them access in a way that keeps you protected (meaning if you don’t use Lastpass, at least have some type of signed contract that states they will not misuse your information – this is important, no matter who it is). Speaking of contracts, ALWAYS sign one before working with a designer. Also, NEVER work with a designer who requires 100% of the fee upfront. In this case, they will not have any incentive to actually deliver your completed project. Many people get ripped off this way. Only work with a designer who requires partial payment upfront and the balance at the end of the project (some may even request payment midway through the project, which is fine, as long as the balance is still required at the end of the project as well). That final payment gives them incentive to deliver and keeps you protected. In some cases designers will build your entire site on their hosting account and transfer it over to your hosting account when it’s done. This is a common practice and it helps to protect the designer, because many times they can work with people who leave with a completed design without ever making the final payment. If you do get a designer who builds sites this way, make sure you know it up front. Ask questions and read the contract thoroughly. The contract should be written in a way that protects both parties. Also, make sure there’s some type of time limit or date range for project completion in the contract. The contract should also state that as long as you make the final payment, you will receive your completed and live website transferred to your hosting account within the time stated. My intention with this post was to give as much information as possible so that people can make informed decisions about their business websites. I care about everyone’s success, not just mine. It’s important to me that people make the best decisions for their business websites, whether they decide to DIY or hire a designer. Don’t just take people’s word for it or listen to other “newbies” and do what they did. Do your research, ask tech experts, and make informed decisions for your business. What did you learn from this post that you didn’t already know? What benefits have you experienced from owning your own site and having control of it? 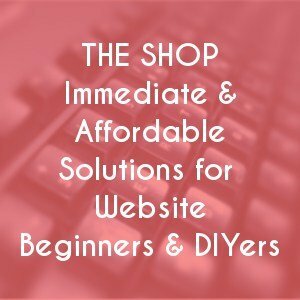 What tips do you have for others looking to DIY with WordPress or hire a designer?